Gazelles are a kind of antelope. They are in the genera Gazella, Eudorcas and Nanger. Gazelles are mostly found in the grasslands and savannas of Africa, but they are also found in southwest Asia. 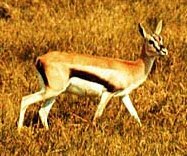 Gazelles are known as fast animals. They can reach high speeds for long periods of time. They usually live in herds. They eat plants and leaves. They show a special way of running slowly and jumping high when they are chased by lions or cheetahs. Gazelle comes from the Arabic ghazăl (Arabic: غزال‎). Wikimedia Commons has media related to Eudorcas. Wikimedia Commons has media related to Nanger. ↑ Walter, Henriette; Fawcett, Peter D. (1994). Peter D. Fawcett, ed. French inside out: the worldwide development of the French language in the past, the present and the future (Illustrated ed.). Routledge. p. 66. ISBN 0415076692, 9780415076692 Check |isbn= value: invalid character (help). This page was last changed on 7 January 2019, at 10:00.